The sound files will download slowly because of the size. Save them to your computer and you need not download again. Select on your computer where you wish to save the files. 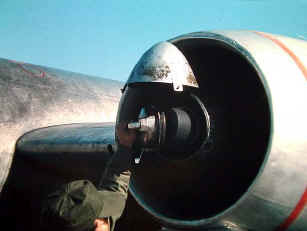 The cartridge starting system of the B-57 allowed it to operate with little ground support. The flight crew could install the cartridge affording a self-sufficient, quick reflex, world-wide capability. 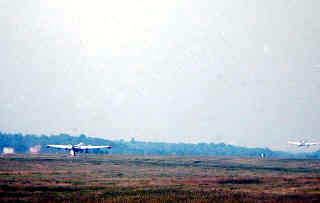 During taxi, the long tubes of the engine caused a distinc- tive "wow-wow" sound with the throttles below 55%. The sounds heard on this recording were used as part of a test and were not considered good practice. Crews also used the sound to "show-off." It worked. But the takeoff sound was a thrill for anyone who loves flying ---- it was as though you were going with them. 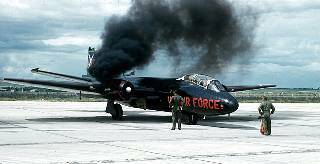 Click either photo to hear the sound of a B-57 takeoff. 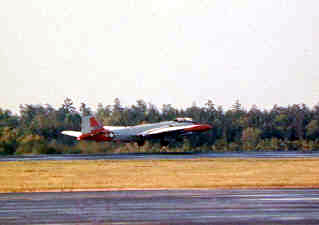 The start engine sound was recorded by Mark Witt at Otis AFB, in 1972; the taxi and takeoff sounds were recorded by the Air Force at Eglin AFB April 1959 (courtesy of Michael Harmon). Click either photo. You are cleared for takeoff. 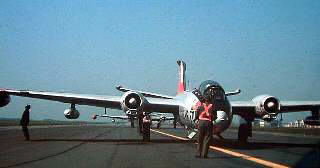 The black B-57 start photo is by John Harris. 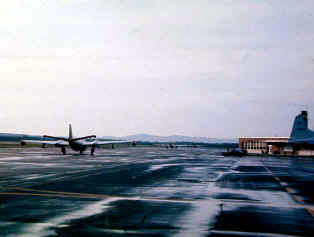 Other photo- graphs were taken by an Air Force Organizational Readiness (ORI) team at Otis AFB and were provided by John Harris, 4713 DSES Commander. © Copyright Marquis G. Witt, 1998,1999, 2000, 2001,2002,2003,2004, 2005, 2006,2011: Materials may be freely copied and distributed subject to the inclusion of the copyright notice and the web site address. The site is intended for historical and informational purposes. This site contains links to other Internet sites. These links are not endorsements of any products or services in such sites, and no information in such sites has been endorsed or approved by this site.